Actually got around to looking a CUDA on Nvidia cards at work yesterday. Got the SDK and sample code up and running on the mac pro, next thing to do is find some maths problem to do on it which will be faster than on a CPU / Grid. well at least that it will be faster given a better GPU the NVIDIA GT 120 isn’t that fast considering there is 2 Xenon quad core chips 2.4ghz. on the mac then there at 6 macs connected to the Xgrid. so it will be a bit hard to do a direct comparison. Also had a informal meeting with the lab manager from physics we discussed how that for ever increasing amount of remote courses at the university how he plans to do physics labs for the astronomy course next year. Ended up sending him to have a look at the UTS remote labs http://remotelabs.eng.uts.edu.au/ and told him to keep us posted since it’s all of interest. So any ideas how to show that CUDA and GPU computing is useful ? or how to conduct an astronomy lab when your students are in Queensland ? If your a commonwealth bank customer and you use ubuntu or other linux OS you may find that the Netbank website is extremely slow to login to. by the way this was found out by putting a complaint into the commonwealth bank which the complaint was swiftly replied to with generic flush your DNS for windows instructions and further instructions saying that AVG link scanner also is known to slow down Netbank. but once I dismissed these solutions as not solving the problem they then actually asked real questions got me to try and different dns server. I also got plenty of phone calls check that my problem has been resolved or that at least someone is attempting to fix it so there ads must be right.. In the long run Commonwealth bank need to fix there DNS so that there sub-domain address is faster to look up. In the short term my problem is fixed if it’s only a speed increase when I log into Netbank for the 2nd time, since the cache seems to clear on each restart. AGVCRtoMPEG2 – is an old and outdated program that can convert your AGVCR recordings to avi or mp3. Next we have to edit the scons file in cd ~/AGVCRToMPEG2 , it is meant to take the command argument of where you complied the version of ffmpeg but it seems to use old and outdated scons code so we hard code the location in. To make things easier attached is the output of svn diff AGVCRTOMPEG2_904update.patch Note gunzip because of wordpress security doesn’t allow patch files. Readme contains many examples and hopefully you now have a working system. Today Kymberly and I had our engagement party. If you haven’t kept pace and I don’t blame you since I haven’t updated the blog. But yes, we are engaged. I asked Kym to marry me on the 16th of June, and she said yes. Romantic stories are for another blog far far away. 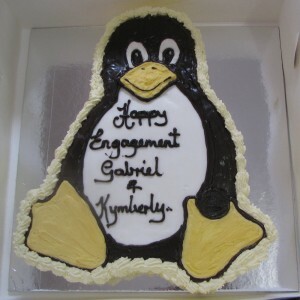 Anyway I really wanted to share our lovely Engagement Cake… If you know why you have an engagement cake be sure to tell me. But it kept the future mother in-law happy. Uni, new degree and blog fame. Firstly I’ve had a hard time getting to the rhythm of uni life again. For those who care I’ve changed degrees. I decided to after spending a lot of time last year in the engineering building, it holds my interest more than maths I changed degrees this year from my B. Mathematics degree to a B. Engineering (computer) / B. Mathematics Combined. Of course this makes everything feel weird as I go from ELEC1700 first year subject to a 3rd year subject in programmable logic then number theory. A lot of people had a good laugh at my last blog post actually it has been my most popular to date. I didn’t really mind people laughing since if I did I wouldn’t of blogged. I did get a couple strange comments though, a lot of if its a server config use a server.. someone said to use a Mac ?! and this guy from windows watch, miss labeled Mandriva as a live cd which it isn’t (sorta technically you can argue) and then segwayed into why having no screen or keyboard is good. I don’t really see my computer as a serious server, yes it’s on 24/7, it is my personal SVN server but why spend a tonne of money I don’t have just so I can easier sync my uni work between my laptops and desktop, and have some revision control on the programs and latex files I write. Just a note for me while I slowly re-build my computer. Some documentation that comes in handy.